For its dedicated users, Pinterest acts as a place to research, learn and shop. They’re more likely to spend more after seeing a promotion and they plan twice as early than people using different platforms. The user base may not be as large as Facebook but the platform acts more like a discovery and save tool than a social interaction network. This niche market makes it a dream for marketers to target at different points of the buying process. Strong imagery goes a long way for Pins. Its cascading feed heavily favors Pins that are at an image aspect ratio of 2:3 to 1:3.5. For businesses, optimizing your website and existing Pins for search are the first steps in Pinterest marketing. But what else should you know? We’ll share 15 statistics that will help hone your marketing efforts. That’s a lot of buying power. While 40% of Pinners have a household income of $100k+, 50% make $50k+. Pinners are ready to spend and willing to spend more than their non-Pinning counterparts. We’ll go more into that statistic later on. Of the other social platforms, it’s fourth in popularity, behind YouTube, Facebook and Instagram. However, the metric has been slowly climbing. According to Pinterest’s own demographic data, more than half of Pinners are international and more than half of new signups are men. This means that even if US audiences aren’t gaining as quickly, there’s potential for an international audience to take off. The tech-savvy generation is all about Pinterest. For adults aged 18–34, or the millennial generation, half of them use Pinterest at least once a month. This age group is special because it marks a lot of adult milestones. People are graduating from college, working at their first job, having relationships, getting married and having kids. There’s a lot to be planned and Pinterest is how the plans get done. In fact, 86% of millennial Pinners use the network to plan for life’s moments. Since they also have some disposable income and spending power, it goes without saying that they’re buying for these milestones. Pinterest is so crucial that they spend 17% more than a millennial who doesn’t use Pinterest. For brands, this means that educational content can perform well. Products that are related to these milestones will also receive a lot of impressions. For example, tips on shopping for a new home or useful kitchen appliances target this age group. Bank of America uses Pinterest to create an online resource for people to be more financially literate. Their Boards address all the life milestones from wedding planning to having a new money. The Pins are tagged with their branded #BetterMoneyHabits hashtag and lead to educational content. With 200 million monthly users, 93% is a lot of people who want to purchase something. It makes a good business case for advertising on Pinterest. Create content for various stages of the purchase process. Forty percent of Pinners reached were new to the brand advertising on the network. Create some educational content, share information about your product and then retarget them once they’re familiar with your brand. Pinterest’s Promoted Pins are naturally part of a user’s feed. Scattered among pins from Pinners they follow, are Pins that brands have created to promote to a certain demographic. Half of Pinterest’s users have purchased something after seeing a Promoted Pin in their feed. To take advantage of this, you need to first create Pins that are relevant to the audience you’re targeting. The more specific and useful the Pin is, the better. For example, you don’t want to advertise your chocolate to those who are searching for recipes. Better, you want to target people who are looking for sweet gift ideas or looking up decadent chocolate recipes. Pinners love their phones. When looking for recipe ideas or tips for styling a home, Pinterest is the first option and 85% of those searches are through the app. When a search result page first comes up, the top bar will list topics that are often searched with the first set of terms. It offers users more in-depth exploration. Content from verified websites appear higher in Pinterest’s search results. And relevant hashtags serve as another search modification tool. For brands, this means that understanding Pinterest’s SEO process is key to showing up in search results. Your descriptions should actually describe the Pin and what the Pinner is looking for. Enabling Rich Pins on your site also means that Pinners can receive even more content when they open a Pin. Quality images and a high aspect ratio are key to getting your Pins noticed. You want their thumb to pause because the Pin caught their eye. If text is absolutely needed, a brief title or description of the Pin should be more than enough. IKEA uses its Boards to address different audience demographics. In its “Small Space Living” Board, they have Pins that help apartment dwellers figure out how to maximize their space. The above Pin has keywords like “small outdoor space” and their product name to help with search results. Forty-eight percent of Pinners save Pins in the Art, Art Supplies and Hobbies category. Unsurprisingly, the second most popular category at 47% of Pinners is Flowers, Food, Drinks and Gifts. The top two categories alone span a lot of industries. Brands can use this to their advantage by seeing where they fit in with Pinners’ interests. If your product isn’t directly in the hobbies category, you could create adjacent content. Wayfair sells a wide variety of items online. While they do use a lot of lifestyle photos for their furniture products, they also sell smaller items. This Pin demonstrates a quick DIY project that makes use of several of their products. Clicking through takes you to a list of all the involved products for an easy shopping experience. Unlike other networks where branded content has become exhausting, 78% of Pinners welcome content from brands. Furthermore, 66% buy something after seeing a brand’s Pins. Remember, Pinners use the network to research and plan. It makes sense that Boards are created for shopping purposes. The beauty of Pinning content is that every Repin means more eyes on your content. And if Pinners are researching, they’re going back and looking through their Pins. Your content gets to live on the network for far beyond the initial Pin. If your Pin is Buyable, it makes the shopping experience more seamless for the customers. Evergreen content is content that can be useful beyond its publishing date. For Carnival Cruise Line, that means Pins like cruise fashion, best bites in a destination city and tips for planning a cruise wedding are useful year round. Pinterest isn’t just for saving DIY ideas for the bedroom. It’s also for saving product ideas for future purchases. Fifty-five percent of Pinners say they use Pinterest to shop for and find products. This is great news for advertisers who sell products. Pinterest’s advertising platform includes a few different goals like increase brand awareness, increase in-store sales and boost website traffic. You can also easily promote a Pin that’s already performing well. Baileys promoted one of their popular Pins about a Baileys sundae recipe. It appeared among drink recipes. The timing of it is also perfect since summer weather calls for an ice cream sundae. Retailers rejoice. These Pinners are also 39% more likely to be active retail shoppers. 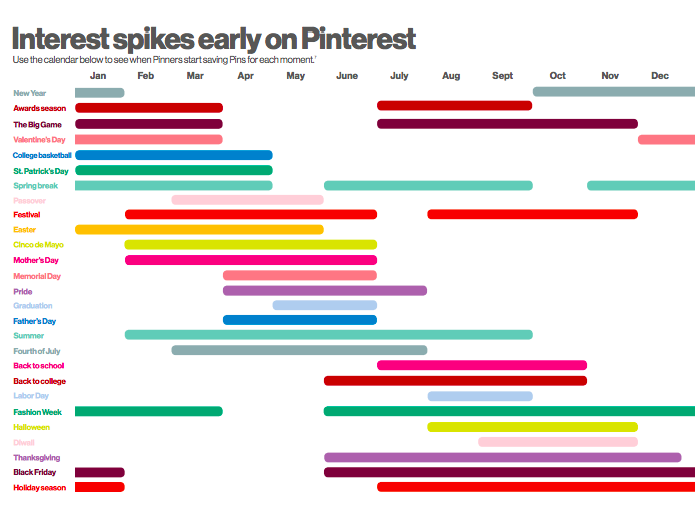 It’s likely that those who plan ahead of time on Pinterest are also more informed customers. They spend after researching, which could make them more dedicated customers. In fact, 90% of Pinterest’s users say that the network helps them decide what to purchase. That’s a whopping amount of people who are looking to purchase things. To make it easy for potential customers to research you, install the Save button on your website and optimize your product pages for Product Pins. Having Product Pins allow customers to see the price along with a short description directly in Pinterest. Don’t assume that it’s all online shopping either. Forty-one percent of Pinners who shop in-store also use Pinterest while shopping. If they’re shopping for products, it makes sense that they would reference Pinterest to make sure they’re finding the correct ones. Pinners like to create Boards for their next trip, the baby shower they’re planning and gift ideas for their spouse. In fact, they like to plan far ahead of time. Pinterest data states this being twice as early than people who don’t use Pinterest. In the cycle of content production and advertising planning, it means you need to be looking several months ahead for major holidays. Best gifts for moms are Pinned starting in February. For businesses who want to target around special days, Pinterest offers a Possibilities Planner that shares a calendar for planning and content ideas for each one. Travel is a big category on Pinterest. Boards are created for new trips and for general research purposes. Adding collaborators to the Boards make group trip research easy. Seventy-five percent of travel Pinners find brand content useful. And 49% of US travelers who spend $1000 or more on travel are on Pinterest. That’s a good group of people who are willing to pay for the right experiences. Your brand may not be a travel brand like a cruise ship but chances are that you overlap into the travel audience. For example, a coffee shop can Pin the best coffee shops in their city for tourists who are traveling to their area. Or a cooking class can advertise to those who are interested in food and travel. Road Affair is a travel blog written by a globe-trotting couple. Their Pins vary from travel guides to travel inspirations. The Antigua guide shows up in search results for anyone who’s searching for the specific term. But the Board that it rests on is a collaborative one that its 116k+ followers can find easily, too. Instead of a passive consumption of media, Pinterest users are active on the site. Data shows 70% of Pinners will search, save or click on a Pin. For businesses, this means that putting in the effort of properly describing a Pin and Pinning it to the correct Board pays off. If your goods or services match the more popular categories, then a Pinterest strategy should be incorporated into your marketing. Rich Pins give more information than regular Pins. Articles contain publisher and author information, Product Pins contain pricing and Recipe Pins have all the ingredients listed for you. Because these Rich Pins contain more information and are from verified websites, they’re more likely to be shared in the network. In one day, 14 million articles are Pinned. If you have a business blog, take a moment to optimize it for an Article Pin. Clicking on a link from one social network registers it as social referral traffic on the site you visit. Because of its long history and large network, Facebook is usually at the top of all social referral traffic. 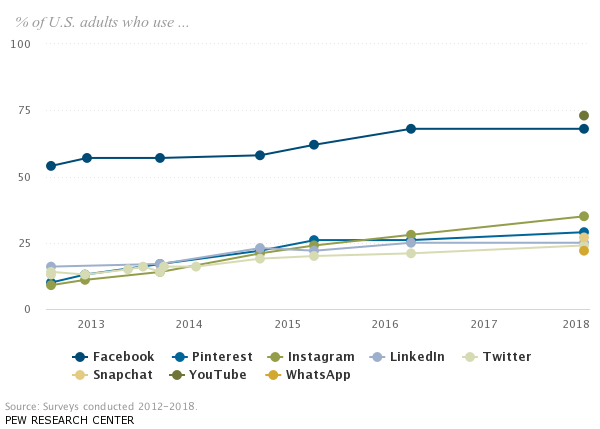 But from 2016 to 2017, Facebook’s traffic dropped by 25.80% and was replaced by networks like Pinterest, Instagram and YouTube. Pinterest had a 27.49% increase in social referral traffic from 2016 to 2017. For a site that exists to collate ideas from other sites, this growth makes sense. Paired with an internationally growing user base and more advertising opportunities being made available, we should expect even more referral traffic growth. Pinterest users are dedicated shoppers, savers and planners. With great visual content, brands can put their advertising dollars to work and target customers who are receptive to branded content. Even if you’re not ready to Pin everyday, you can still make steps to optimize your website and welcome Pinners. We’d love to hear from you – are you on Pinterest? What has your brand’s experience been like?